Hey guys! 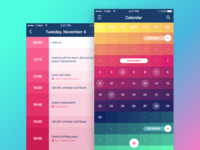 Remember the colorful Calendar app of Ludmila? Like it? I do, that's why I decided to make an animated rebound to it. Feel free to comment and hit L if you like it. 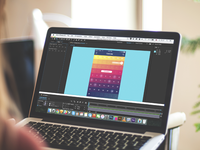 Don't pass by our Tubik studio blog too where we share interesting and inspiring stuff, like tips from well known designer experts and a lot of other fascinating articles that might come in handy. Hope you find something useful in there.